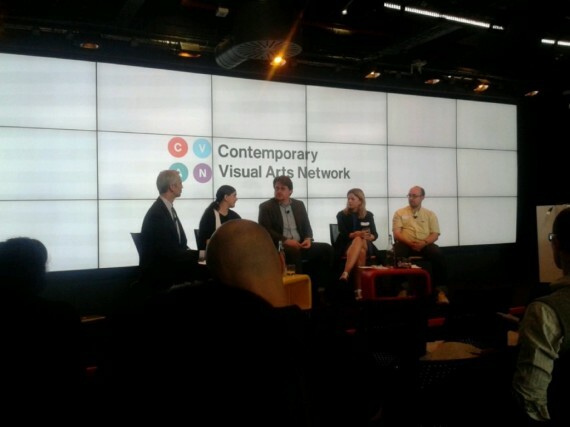 The Contemporary Visual Arts Network’s knowledge sharing event at Google’s London office was a high-impact juxtaposition between one of the world’s most successful companies and the subsidised visual arts sector. Dany Louise reports. With an idea approaching genius, the Contemporary Visual Arts Network (CVAN) persuaded Google’s Cultural Institute to host the last of its series of knowledge sharing events at Google’s London headquarters last week. The result was a high-impact juxtaposition between one of the world’s most successful companies and the subsidised visual arts sector. It was, to put it bluntly, a collision between rich and poor, private and public sectors, extreme confidence and extreme insecurity. “We’re looking for ways to innovate and we need to be thinking differently,” said a-n director Susan Jones in her introduction. “Today’s format is designed to help us think better, scan the horizon and build our collective knowledge and ambition.” A crucial part of making this possible was the embodiment of those concepts within the venue. But underlying the opulence is genuine confidence in what Google has achieved, and crucially, in what it will achieve. Its policies are intended to enable staff – known as ‘Googlers’ – to work as productively as possible. They are constantly future scanning via all sorts of non-commercial projects, often initiated by individual staff being allowed to explore their own interests in their “20% personal time”. The day focused on discussion about pertinent arts administration matters with an eye on future uses of technology – for example, how to engage with a globalising audience, and how arts organisations can create rich digital experiences. Googlers were generous with their time and expertise in providing insight, presenting on Cultural Institute projects and the free tools they provide to help with website optimisation. James Davis, formerly of Tate and now program manager with the archival Google Art Project, gave a comprehensive presentation on its history, substance and limitations. With an audience “in the tens of millions” it is hugely significant to curators and scholars, not least its use of gigapixel technology and emphasis on traditional historical works. But at present it doesn’t include and present work by contemporary artists. I asked Sheila McGregor, director of Axisweb, whether she considers the project an opportunity? The speed with which your website loads is crucial. What is the optimum response time? “Faster than your nearest competitor,” says Luisella. “But for e-commerce sites, two seconds is too long. Don’t keep your customers waiting.” Test your own, and your competitors’ sites here, and test how mobile-friendly your site is here. Luisella’s general rule is: “Send the least amount of data possible. Compress images.” Piotr Adamczyk talked about the importance of “universal design” – that “building content to serve the entire spectrum is a design consideration.” Allied to this is content: “Remember that artspeak and jargon will not translate well in other countries,” added Alistair Gentry, a point relevant for the national audience as well. But pervasive technology presents its own conundrum. Technology facilitates mobilisation of and engagement with audiences, but conversely, the huge amount of digital noise creates enormous competition for audience time and attention. Other conversations were around collaboration and the need to mobilise non-sector partners and beneficiaries. “We need to tell it like it is, which is that we are absolutely embedded across a range of sectors on a daily basis, with health services, with industry, with education, with local authorities. We need to mobilise those voices that engage with the work we do,” suggested Amanda King, south east co-ordinator for CVAN. Is this an invitation for a return visit and the development of a deeper reciprocal relationship? It’s an intriguing speculation. This article was co-published with Guardian Culture Professionals Network.